EMCO Building Products is a manufacturer of seamless coil and accessories for siding, roofing and gutters and is committed to providing our customers with innovative, best-in-class materials, focusing on productive inventory management that maximizes your profitability. 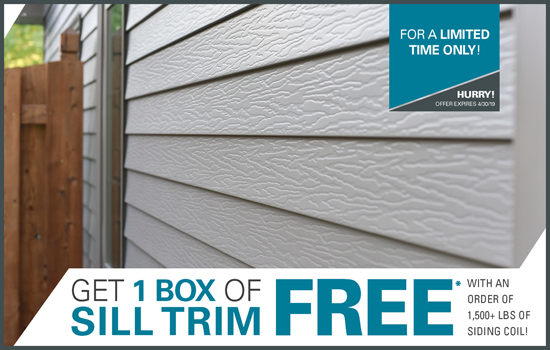 For a limited time, EMCO Building Products will be offering offering one box of sill trim FREE when you order 1,500 lbs or more of EMCO Building Products siding coil! Available NOW through April 30, 2019! Contact your EMCO sale representative or customer service today at 877-673-3626 or email us at customer.service@emcobuildingproducts.com for more information or to place an order. DETAILS OF OFFER: Receive one box of EMCO Building Products sill trim for FREE when you order 1,500 lbs or more of EMCO Building Products siding coil. Offer expires April 30, 2019. Non-transferable, valid only to the recipients of this email. Offer is subject to change without notice. No cash value. Offer is not valid with any other offer or discount on existing projects, quotes or prior purchases. Offer is only available in the contiguous United States. Available only at EMCO Building Products, Inc.